BETHESDA, Md.--(BUSINESS WIRE)-- BrainScope today announced that it has been awarded a research contract by the United States Department of Defense (DOD) valued at $4.5 million to create and integrate ocular capabilities into its handheld, multi-parameter mild Traumatic Brain Injury (mTBI) and concussion products. BrainScope’s mission is to revolutionize the rapid and objective assessment of brain-related conditions, starting with concussion and mild traumatic brain injury (mTBI), utilizing multiple integrated assessment capabilities, artificial intelligence (AI) and digitization within a culture of quality, excellence and entrepreneurialism. 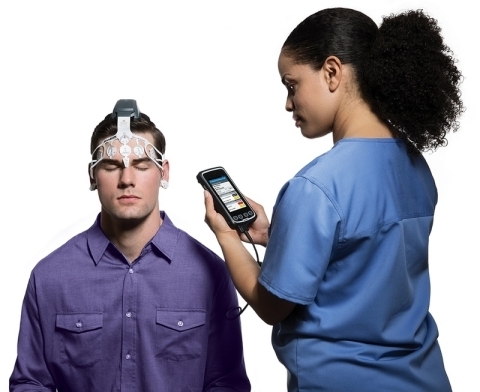 The Company’s first product, BrainScope One (cleared as Ahead 300), incorporates a multi-modal panel of capabilities including EEG-based technology that is non-invasive for mildly presenting head injured patients, 18-85 years old, within 3 days after injury and is not a replacement to CT scan. BrainScope’s technology platform integrates databases of thousands of brainwave recordings with AI technology and miniaturized hardware and disposable headset sensors, all of which are covered by an extensive intellectual property portfolio of over 100 issued and pending patents globally. BrainScope has received five FDA clearances and ISO 13485:2003 Certification. It has 24 peer-reviewed publications on its technology. Recent white papers authored by third parties have shown the potential for BrainScope One to decrease unnecessary head CT scans by one-third, to reduce head injury referrals to hospital emergency departments by up to 75%, and to reduce healthcare costs for payers and patients by over 30%. BrainScope has partnered with the U.S. Department of Defense for the development of its TBI assessment technology, and BrainScope One is currently being fielded by the U.S. military, both stateside and internationally. BrainScope One is also being utilized in a cross-section of market segments including: urgent care and occupational health clinics; concussion clinics; hospital emergency rooms; university sports and student health centers; professional sports; and pharmaceutical clinical trials. BrainScope has been the recipient of several prestigious awards, including the Frost & Sullivan 2017 Best Practices Award for New Product Innovation in the Traumatic Brain Injury Assessment Solutions Market, was a two-time winner of the GE-NFL Head Health Challenge, and has received two nominations for the Prix Galien Best Medical Technology, regarded as the equivalent of the Nobel Prize for medical devices. For more information, please visit www.brainscope.com. This work is supported by the US Army Medical Research and Materiel Command under Contract No. W81XWH-18-C-0157. The views, opinions and/or findings contained in this report are those of BrainScope and should not be construed as an official Department of the Army position, policy or decision unless so designated by other documentation.